We start back up with Eason and Ming Ming’s accidental kiss. When Ming Ming tries to leave after Qiong Zi calls, Eason asks her what she’s afraid of. He also insists that she stay at his place until the storm passes or else what will he do if she gets nailed by a tree or a falling sign and gets hurt? Ming Ming does agree to stay and silently answers Eason’s question as the two FINALLY dig into the cake and champagne. It wasn’t that she was afraid—it was just that in that moment she couldn’t hide her feelings for him which are ready to burst out. Shao Tian wakes up after spending all night on Ming Ming’s sofa. He goes to her room and knocks on the wall telling her its time to get up. He’s surprised that she really did spend all night out. He then gets a call from a disappointed Ru En (she didn’t get any more steamy pictures nor did she capture Ming Ming’s leaving on film). Shao Tian immediately rushes off after learning where Ming Ming spent the night. Unbeknownst to him, Wang Mama followed him after overhearing him mention her daughter’s name. Ming Ming wakes up cuddled in Eason’s lap on his small sofa. She smiles and quickly closes her eyes once more (we do get a voice over with her saying that neither of them knew that their relationship would change and there would be only stormy skies ahead). Eason does the same. It’s cute as it really showcases how much these two like each other. Then a knock resounds on the door. Ming Ming is afraid it’s Qiong Zi and doesn’t want her to misunderstand. She rushes into the bathroom as Eason opens the door. Eason is livid that Shao Tian has brought a reporter with him. 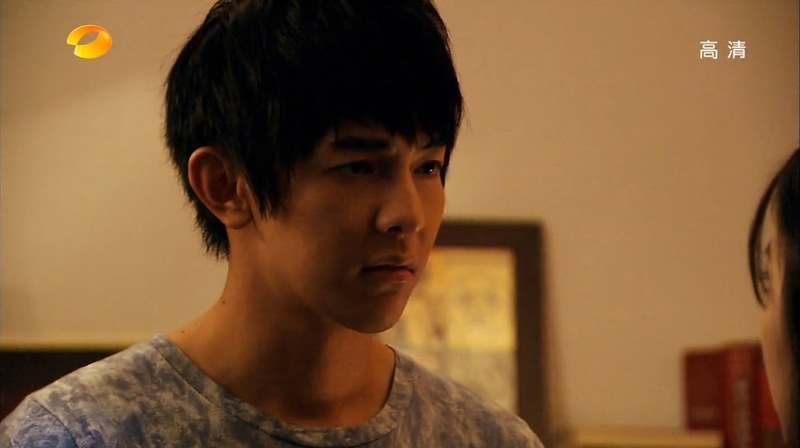 Shao Tian just storms into the apartment where he finds Ming Ming hiding in the bathroom. Shao Tian immediately turns on Eason and slaps him. While the two boys are scuffling and Ru En is snapping pictures, Mrs. Wang enters. She is most unhappy to catch her daughter in such a situation. Since Ru En is there, she won’t yell at Ming Ming and only orders Eason and Ming Ming to leave with her. Shao Tian meets with Ru En who is excited about publishing an article whose headline reads that Eason is two-timing Pei Ni with the scriptwriter. Shao Tian immediately says she cannot publish such news as it wouldn’t help the drama, but rather it would undoubtedly harm it. Ru En says that an exclusive is worth a lot of money and she is shocked when Shao Tian vows to pay it himself. Ru En agrees not to run the piece and asks Shao Tian to be her boyfriend in return as she’s always regretted their relationship stopped before it started. Shao Tian cannot agree to this and really clams up at that. Ru En says she was just kidding. She does ask what his relationship is to Ming Ming that he would go to such lengths. Shao Tian cannot believe another person is asking him the same thing. He very assuredly says that he honestly doesn’t feel that way about Ming Ming. Right. Like he wasn’t just acting like a jealous boy when he saw Eason and Ming Ming together. Eason and Ming Ming see Mrs. Wang off and then go for a walk. Ming Ming sincerely thanks Eason. What for? Ming Ming thanks him for acting in front of her mother as it’s been a long time since Mrs. Wang has smiled like that. LOL. Eason’s face—he was completely shocked that Ming Ming thought it was all an act! Ming Ming goes to leave after promising their relationship will go back to actor and scriptwriter and she won’t bother him again. She walks away and Eason finally yells out that he was serious and runs after her to stop her. He may not know when liking her started, but he has sincerely fallen for Ming Ming. The two then share a sweet kiss accompanied by Jiro’s insert song for the drama. The two walk back to Ming Ming’s apartment and Eason has a voice over where he talks about them not thinking about the troubled road that lies ahead. He can only think about what Ming Ming always says to him and that’s to do their best. When they arrive at Ming Ming’s, Eason goes for a kiss, but Ming Ming dodges him shyly. The two smile and before she heads in, Ming Ming does give him a quick peck on the mouth. Inside, Ming Ming gets down to work on episode 7 (which we see acted out between Pei Ni and Eason in her imagination) where she has Fang Meng and Mei Guo do everything that she and Eason did together, from Eason’s personal concert at the bar to the amusement park. Afterwards, Fang Meng passes out again. PD Zhuo calls the episode rather obvious and over done, but on the other hand, it’s very well written. In fact, she couldn’t help but be drawn in. This makes Ming Ming happy, especially when Zhuo says they will use the script as is. Ming Ming leaves and the assistant says that while the episode is good, Ming Ming still hasn’t written in Ouyang Cheng’s character. Zhuo tells him not to worry as she has seen Ouyang’s character in the script. It also looks like they are going behind Ming Ming’s back to find a replacement scriptwriter since Ming Ming cannot be controlled. Eason is memorizing his lines while the director talks to Ming Ming about some script revisions. Eason takes out his phone and texts Ming Ming to ask if the director is bullying her again. Ming Ming immediately gives him an okay sign behind her back. The director leaves and Eason comes over. Sheesh, these two. Because standing back to back and talking makes it obviously look like you have no relationship to one another (eye roll). While the two are talking about their experiences with the director, Ouyang Cheng arrives to shoot some scenes, which surprises both Eason and Ming Ming. Of course, with Ouyang’s arrival, the director starts treating Eason poorly again. Shooting begins and we learn that Zhuo has given Ouyang Cheng the role of Fang Meng’s doctor. This way Pei Ni’s Mei Guo won’t instantly fall in love right after Fang Meng passes away. It will be a gradual love as Dr. Wu (who fell in love at first sight with Mei Guo) tries to woo the grieving girl. Ming Ming and Eason are both not happy with this turn of events. Zhuo says that Wu is also a character created by Ming Ming so she should show just as much passion for him as she did for Fang Meng. In the dressing room, Qiong Zi tries to lift her son’s spirits. Actually…given Eason talking about his past to Ming Ming and the fact his mother remarried a wealthy man, I’m beginning to think Qiong Zi really just was a company worker who took a shine to Eason and started supporting him. Anywho, Qiong Zi promises to promote Eason to the best of her ability and Ming Ming apologizes. Eason chides her for this. Thanks to her he lasted two more episodes—she has nothing to be sorry about. The two then decide to take a walk together and get some fresh air. As they leave, Qiong Zi goes downstairs where she finds Ru En being refused entrance (thanks to Ouyang’s being there). Qiong Zi asks Ru En for advice on how to get Eason out there and Ru En asks to know why the set is closed. Will Qiong Zi accidentally spill the beans? Meanwhile, Eason and Ming Ming are at the beach. They come to a pile of stones and Eason balances on it and spreads his arms. He heard from a friend if you get the angle and everything right, you can “fly” away. Ming Ming laughs at this, but does end up joining him. Afterwards, the two sit together and Ming Ming wonders if she can really do anything else for Eason at this point? The only thing she can think of is to lean against his shoulder and just be there for him. End episode. Overall, a cute episode with our main couple finally confessing their feelings, but we all know their love won’t be easy. What will happen next? And when will Shao Tian wake up and smell the roses of the love he has for Ming Ming? This is kinda random but your screencaps made me realize how vibrant DGGG is. There are so many bright, saturated colors in every scene! LOL, tis random, but true! I never really thought about it, but there is lots of vibrant & warm colors on display.